Want to regain your fitness? Want a peaceful tour around the beach? Concerned about the pollution? Solution? Get the best cruiser bike. Ride around the beach or city in style. Cycling will not only help you to save some money, it will also help you to regain your long-lost fitness and stamina. 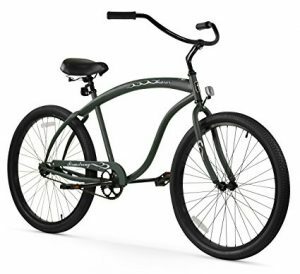 And if you are looking for a bicycle that’s sporty with a combination of comfort, cool beach cruiser bike is what you need. Keeping in mind all the factors to choose a best beach cruiser bikes, we have narrowed down 10 bicycle for you detailing their pros and cons. 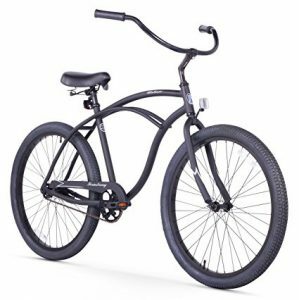 Sixthreezero Men’s in The Barrel 26-inch Beach Cruiser Bike is the style statement. The exotic shape with great durability and strength makes it the perfect bicycle. Bikes With Speed– Though this bicycle and speed doesn’t go hand in hand, Sixthreezero bikes has changed this concept. It’s a 3-speed machine which allows you to challenge your lungs. Perfect Size– Its beasty size makes it perfect for man who are looking for a cycle with machoness in it. 18″ Frame– It’s 18″ frame which is so strong that even Hulk can ride it when he’s tired of jumping around. Its exotic frame design gives you a stylish and comfort ride. Pocket Friendly– With all these features, it doesn’t comes with a lengthy price tag. Its reasonable price makes it more favorite for riders. Accessories– Hit the town with the stylish Internal Shimano hub which completes the style statement. Comfortable grip and saddle made for your comfort. The only discomfort in it is its packaging. Its needs some adjustment to easily unpack the shifters. If you are looking for some adventure around the beach, this is best beach bike, you’ll find in the market for its sheer, comfort, style, durability & of course pricing. 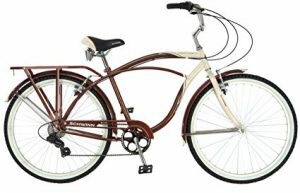 Schwinn Sanctuary 7-Speed (26-Inch Wheels), Cream/Copper, 18 -Inch is praised for its high comfort and manliness in it. This is one of the best beach cruiser brands. It is an extremely rough and tough bicycle with some serious speed. Full Fenders– Perfect for rainy days when you don’t want to stain your back and pants. Quick Gear Shifters– It has Shimano rear 7-speed derailleur with SRAM gear twist-shift which allows it to make quick and smooth gear shifting. Alloy Wheels– Light-weight wheels for a speedy ride with long term durability. Steel Fork– It’s equipped with Schwinn steel fork which are great shock absorbers. Wide Saddle– The wide saddle allows you a comfort journey all along the way. Steel fork for a bumpy free ride. Full fenders to give you a clean ride. Steel Frame which makes it heavier than the rest. A solid body with superb durable structure and components made for an easy and comfortable ride. 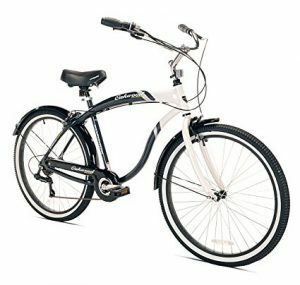 Kent Bay Breeze 7-Speed Men’s Bike, 26-Inch is bicycle that got a touch of style as well as class. It’s modernized frame structure and super light aluminum body makes it the perfect bicycle for everyone. Feather Light Body– Its aluminum structure allows you a swift ride all along. High Speed– Due its light body and strong structure, you can ride along the hills with speed without bursting your lungs. Superb Braking System– With speed comes accidents, so Kent gave you a superb braking system with easy hold for all time. Comfortable Saddle– Its comfortable and scientifically designed saddle allows you for a long ride without any discomfort. Adjustable Saddle– You can adjust the saddle in the height you’re comfort in. Its aluminum body makes it amazingly lightweight with long tem durability. Its cool blue looks add a stroke to its perfection. All of this in a jaw dropping affordable price. The assembling might be a hiccup for the inexperienced people. Kent Bay Breeze 7-Speed Mens beach Cruiser bike, 26-Inch is a bicycle which has got hint of everything from class to style. A light aluminum body make and cheap price makes it perfect for everyone. 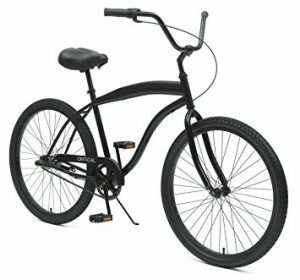 Firmstrong Bruiser Man Beach Bicycle, 26 – inch is the one of the favorite cruiser bike among bike lovers. Its steel frame gives it a dense look contrasted with red rims which attract bikers the most. A perfect bicycle to wander along the beach in style. A strong steel frame which gives it a long-term durability and a strong look. 26′ Aluminum rims that balance the heavy weight of the cycle perfectly for an easy and long ride. Superb and comfortable gripping made for long rides. Spring based seats for comfortable riding. The red color rims complete the stylish look of the bicycle. Perfect for tall and heavy built persons. Comes along with Fenders to protect you from mud stain in rainy days. 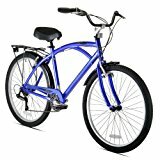 Firmstrong Bruiser Man Beach Bicycle, 26 – inch is a complete stylish lightweight with superb color contrast which comes with long-term durability. A perfect cruiser bike. Another masterpiece from Kent, The Kent Oakwood Men’s best & cheap Cruiser Bike, 26-Inch is a light-weight with superb color contrast and its structure is ideal for the big people. It comes with a chain cover which keeps your chain protected all the time. Its aluminum body and 7 speed gears give you the chance to race with the wind. Comes in an aluminum built body which makes it light-weight, fast and of course, rust free. Amazing braking system which gives you the confidence to ride in high speed. Affordable pricing for such great features. Perfect built for the long and well-built persons. Its shipment is fast as the bicycle speed. The tires don’t look promising and needs to be changed soon after purchase. Kent Oakwood Men’s bicycle, 26-Inch is bicycle you would love to ride all day because of its lightweight body and stylish look. Firmstrong Urban Man Alloy Single Speed Beach Bicycle, 26 – inch is a bicycle every bike lovers’ dreams of. The stylish and elegant matte black color along with superb durability and lightweight body makes it irresistible for the bike lovers. Compact built which makes it perfect for average height persons and well built. The aluminum body makes it light-weight and durable. Its commodious and spring based saddle provides huge comfort for its huge built riders. Its single speed lets you wander along the beach in relax mode. Its easy braking system makes it one of the most simple and comfortable cruiser bike. Its light weight body allows you to have a long ride. Comes in matte black which is everyone’s favorite. Its single speed system doesn’t allow you a speedy ride. 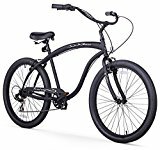 Firmstrong Urban Man Alloy Single Speed Bicycle, 26 – inch got a superb matte black color and design which won’t let you resist. All you want to do is hop on it and ride all day long. The most amazing feature of Firmstrong Urban Beach bicycle is it comes in two sizes and 26 inch precisely. Know which size suits you the best and ride all day long with comfort. Its curved steel frame makes it durable and gives it a firm look. 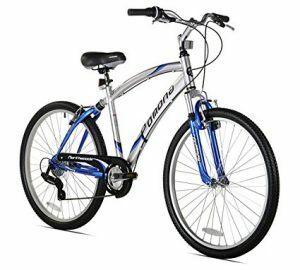 Its 24-26-inch aluminum wheels balances it perfectly for a long and comfortable ride. Its spring based roomy seats will give you comfort like never before. Comes in single speed and 7 speed features. Choices vary from one to another. Not everyone likes speed and some likes it the other way. Waffle treads tires for strong ground grip and also makes it durable and robust performer. Comes with a chain guard. The speed limit in the single speed model. 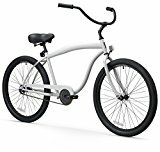 Firmstrong Urban Beach Cruiser Bike is a comfortable and cool looking cruiser bike with superb comfort and all this in an affordable pricing. Its 3-speed feature by Sturmey Archer gives it a smooth and easy gear shifting technology. This one is the best beach cruiser bike with gears It is placed internally for which it gets protected form all kind of harm’s way. Its leather grips give you a superior gripping of the cycle. It comes with coaster brakes. Comfortable seats for a long ride without any kind of trouble. Unsuitable for long or huge built person. This is a black matte color bike and give you a comfort and elucidate your travelling across different territories. 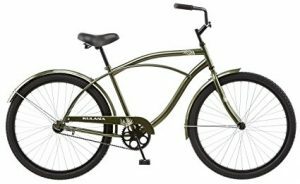 Kulana Men’s Cruiser Bike, 26-Inch, Green is a bicycle from which you can’t take your eyes off. The mesmerizing green color, and the curved frame attract riders like sweet clover attracts bees. You can’t wait to hop on it and ride through the towns and beaches. Its mud resistant design gives you a clean ride even in rainy days. Its steel frame gives a strong and firm look and provides a long durability. Its spring based spacious seat gives you a comfort journey. It’s well customized handlebar gives you a firm grip and control over the bicycle. It’s long and customized fenders block out all the dirt and mud for you. The beautiful and unique green color gives it a mesmerizing look. The bicycle is quite heavy due to its steel frame which makes it difficult for a long ride. 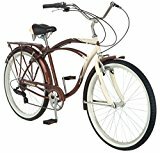 If you are looking for a unique color bicycle which will make you stand out in the crowd in an affordable price and durability, then this is the best men cruiser bike for you. The 26-inch beast is a combination of steel and aluminum which makes it super strong along with light weight and it is incredibly fast. It is a top choice among bicycles. Its firm steel colored look is something you can’t take your eyes of. Superb speed due to its perfect balancing of aluminum and steel. If you are looking for some top speed bikes, then it’s definitely for you. Its aluminum frame makes it amazingly light weight which is also responsible for its high speed. Its gear shifts are made easy and fast with Rear Shimano Derailleur. The soft and bubbly seat gives you a comfortable ride all along. The steel handlebar is hard and durable and is equipped with Ergo-fit and Twist-shifters make it superb comfortable and easy shifting. Cheap priced with high features. Aluminum frames make it light weighted which is perfect for long rides and to carry around. Rust -free material for longevity. This is the best mens cruiser bikes within its price range. If you are looking for something that looks good, extremely fast and durability, your search ends here. Cruiser bikes are the easy riders. It’s the most casual kind of bicycle solely meant for comfort. They are common among vacationers. They are relatively slow when compared with the other kind of bicycles because of their heavy body and balloon tires. It became the perfect choice for beach and city explorers. Between 30’s to 40’s the cruiser bike lost its market but they soon came back with modified models and since then, they are ruling the streets all over the world. It also have a street name, i.e., best beach cruiser bikes, because they are mainly driven around the beaches. Because of their flat tires, they are an excellent rider on flat-terrains and sands. So, it soon became popular among beach and city maunders. What Makes A Cruiser Bikes Differ From Other Bikes? One thing you need to look for is longevity. Try to go for the aluminum frame bikes as they are more durable, light weight and rust free which will give you a comfortable long term ride. Cruisers bikes are meant for a serene ride. You will be pleased if you find contentment in riding the bikes. You don’t want to adjust yourself frequently while riding. It comes in shapes and sizes. You need to choose the right one in which you find comfort the most. You need to look for the seat size, length and height of the handlebar and the distance of the seat from the handlebar. You don’t want to stain your back with mud or dirt while riding a bike. Usually the bikes don’t come with a Fender but guess you would like one to get installed. Well, now you know how to choose the best bicycle. Since there are plenty manufactures roaming around and so many retailers, it’s quite a hectic to choose the right one. For the ease of you, we have narrowed down top 10 cruiser bikes keeping in mind all the factors we discussed. Don’t be fully dependent on what you are reading. Before buying a best beach cruiser bike, there are few things you need to take care off. Here are some tips which will help you to choose the perfect bike for you. Ride it for a distance to make sure you are comfortable enough to spend your hard-earned money for it. Check its height, seat, bicycle handlebar and feel if you are comfortable. Look if you are comfortable with the frame. Check whether the color suits you or not. Check whether it has good shock absorbers or not. Don’t rush into it or don’t let the shopkeeper get into your head. After all you are the one who’s going to pay the bill and ride it home. Check everything individually and carefully, then if you think it’s perfect for you, go for it. As discussed earlier, size matters form one to another. Size plays an important factor in comfort. If you buy a bicycle too high or too low, you will feel great discomfort riding it for long. So, choose wisely. That totally depends on your budget. Sometimes people sell off their bicycle in cheap prices even when they are in good condition. But you need to be an expert to judge the condition of the bike. If the person from whom you’re buying the bike is trustworthy, someone you can rely on, then you can go for it otherwise buy a new one. 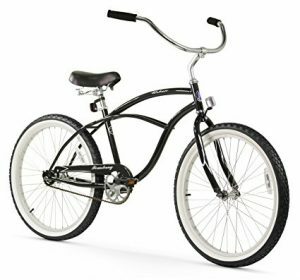 According to me, Northwoods Pomona Men’s Cruiser Bike, 26-Inch is the best among them. If I had to buy a bicycle for me, I would go for the Northwood Pomona. I find the combination of aluminum and steel as the perfect balance for speed and gravity for a long day ride. The 26 aluminum spokes are great shock absorbers, so, bumping won’t be a problem and moreover, it’s so cheap with so much goodness in it. Now you know what a cruiser bike is, how it differs from the others and how to choose the perfect one for yourself. Thanks to its affordability, everyone can own a good bicycle now. Let us think about the future and ride the streets just like old time’. It is good for the environment as well as for you. And bicycle are perfect for everyday use. They are comfortable, durable and affordable too. You can take it to your office, you can take it to the gym, you just can take anywhere you like with ease. Go for the Best Cruiser Bikes now and enjoy the beauty of riding.